What do the following have in common, asks Andrew Busby, Retail Reflections founder? Data, security, Artificial Intelligence (AI), quantum computing, cloud, blockchain and IBM Watson. 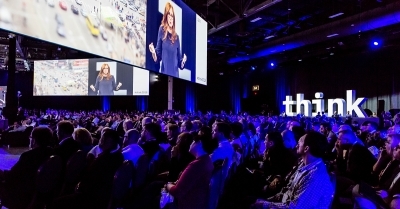 Well, a strong clue comes from the fact that there were all hot topics at the inaugural IBM Think 2018 conference and expo, which took place last week in Las Vegas. Over 30,000 delegates gathered to discuss these technologies, where four particularly stood out in support of trends that no business can ignore and every retailer must embrace. Not for the first time and probably not for the last either, in 2018 AI is in the news - whether in relation to its applications in medicine, automotive, Government, telecoms, media, entertainment, etc. However, it emerged at the IBM event that retail is where AI holds real potential to be a game changer. Not since the birth of the internet has there been such a disruptive technology and the message is very clear for retail brands - if AI is not already strategically embedded into a business, it might as well start planning for bankruptcy. It's THAT critical to success. Quantum computing and blockchain are two disruptive technologies both in a relative state of infancy. But they emerged at the IBM event as having the potential to revolutionise commerce. When blockchain is mentioned, the usual response is to immediately think about its application in cryptocurrencies, like bitcoin. But, many at the event said its ability to connect peer-to-peer in a completely secure and self-authenticating environment means blockchain will disrupt almost every business model in some way or other. Online marketplaces could find themselves under threat where, if the brand can go directly to the consumer, why would they bother with the middle man? As a result, retail supplier relationships will change and with it, will we as consumers always need to transact directly with a retailer? Meanwhile, quantum computing is starting to come of age, ushering in a new way to view the processing of bits and bytes, where they are no longer digital and binary (i.e. 0 or 1), but where 'superpositions' multiple state of bits can exist. Discussions at the IBN event centred on how this will translate to much faster compute capacity. At Retail Week Live earlier this month, Steve Rowe, chief executive of Marks and Spencer (M&S), declared that the retailer is :"drowning in data" and that it "couldn't join [up] the dots". M&S should have sent some of its IT team to IBM Think to learn how these technology-driven trends could help the retailer derive some tangible insight from its data that would help it "join up the dots". While it's easy to get lost in one particular technology, believing it to be the answer to a business's prayers, it is simply not the case. AI may just be the single biggest piece of the jigsaw. But wants to make the case for combining it with cloud, blockchain, quantum computing, Big Data, security using Watson to unlock possibilities from the data. To quote from IBM: "Let's put smart to work."